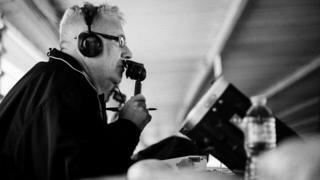 Ali Brownlee's passion for his beloved Boro made him a huge hit with fellow fans and at least one England manager during his 33 years commentating on Middlesbrough matches. "He was the narrator for - to date - the most special moments in the club's history," says former Boro player and manager and England boss Gareth Southgate. "He found the balance of criticism and support, above all displaying his love for the football club." "He wore that as a badge of honour," says Gordon Cox, his best friend and a colleague for many years, adding: "It was a pointless exercise to pretend he was anything other than a big Boro fan. "He was the "king" of fan commentators, according to former Middlesbrough forward John Hendrie, while Gary Gill, another ex-player who Ali enlisted as a summariser, says: "Ali had the knowledge too; he knew more about the club than anyone else." In 1998, with a gig presenting on Boro TV helping to fill the time between matches, Ali went full time in the media, returning to the rebranded BBC Tees 10 years later.For a married man with two young daughters, leaving the security of the bank for the uncertainty of seasonal work was a risk. "I told him he had to go for it," says his wife Wendy, whom he had married in 1987. He inspired others, like future World Cup commentator Vicki Sparks who met Ali when she was a cub reporter at BBC London. "He was just so happy to be there and had this boyish enjoyment for football which the fans shared and loved," she says. "He encapsulated the emotion of the moment. "Ali was totally unscripted, preferring to speak off the cuff, which led to his most famous line in 2006 when Boro secured a place in the Uefa Cup final with a 4-2 win over Steaua Bucharest. "Party, party, party, everybody round my house for a parmo," he screamed. Like the parmo pictured above, Ali was a proud product of Middlesbrough.He judged an annual parmo competition in his hometown and his friends mark each anniversary of his death by eating one in his memory.But Ali held a dark secret. "He didn't actually like parmos," Wendy says. "He much preferred his fish-and-chip Fridays. "And although he disliked his town's signature dish, he loved the place. "He never wanted to live anywhere else," says his father Malcolm.And there had been opportunities to move.When Century FM acquired the commentary rights for Manchester United, station bosses asked Ali to be the voice of the Red Devils.He politely declined. "The BBC could have offered him John Motson's job and Ali would still not leave," says Wendy's brother, Ronnie Lynas.Gordon says Ali recognised Teesside had its flaws but he saw so much to celebrate. "He was the area's champion and defender," his best friend says. "He believed in it." Ali was born on 14 April 1959 in Byelands Street in Middlesbrough, within shouting distance of Boro's former home, Ayresome Park. The first child of Malcolm and Mavis, Ali was a chatterbox from the outset. "I always say he was inoculated with a gramophone needle," laughs Malcolm.He left school at 16 to work for Barclays, rising to be a small loans manager.A lover of Shakespeare, he enjoyed amateur dramatics and had a distinctive fashion sense with his colourful coats, berets and braces. It was in Middlesbrough that he met Wendy, the pair dancing together at Maddison's nightclub. "He was tall and slim with blonde curly hair and blue eyes," she says. "It was always his winning blue eyes that got me. "Ali took her for drives in the country, Wendy being impressed with his ability to handle his father's red Talbot.His first love had been Noddy: a set of the books was all he packed during one childhood attempt to leave home.Then at eight he was introduced to his local football club. From the moment Ali donned his first red-and-white scarf and his father lifted him over the turnstile into Ayresome Park, he was hooked. "I remember him telling me his dad's introduction to the team being: 'You see that lot down there son, they'll always let you down'," recalls Gareth Southgate. "Any of us could relate to that. "Each week, a young Ali stood transfixed in the Holgate End, particularly taken with Boro's defender-turned-striker John Hickton. "Alastair would not leave until the last player had left the pitch," says Malcolm. "Even when Boro were 3-0 down and fans were filing out, he would stay exactly where he was. "He always believed they could turn it around. "Ali's younger sister Jennifer remembers a family trip to Norfolk being interrupted by an impromptu visit to London when a 12-year-old Ali found out Boro were playing West Ham that night.He also left the family holiday early, getting the train home alone to get to the Saturday game. Ali also enjoyed having a kick-about himself, although it was not always the ball that he walloped. "He was an animal," laughs Ronnie, who played alongside Ali for FC Acklam.His style was modelled on Stuart Boam, the tough-tackling captain of Jack Charlton's promotion-winning side of 1974. "Alastair was the dirtiest centre-half around," his father chuckles.Gordon agrees: "It was almost a case of if he got the ball it was accidental. "Ali founded the Junior Reds, a youth fan club for his beloved Boro.Through that he met the sports reporters for BBC Radio Cleveland, and they helped him mature from being a fan to the fan with a microphone.Wendy became increasingly aware of her status as a football widow, but there was no point complaining. "We knew he was busy on match-days," says his elder daughter Alison, "but he made the time we spent with him so special so we never felt like we missed anything." Ali missed Alison's birth in February 1985 because he was covering Boro's 1-0 home defeat to Notts County.He made up for it by presenting his new daughter with a Junior Reds badge. "Ali spoiled his family," says Wendy, known to listeners of Ali's breakfast show on BBC Tees as Mrs B. "He was just so kind, generous and loving. "Listeners to his breakfast show, which started in May 2011, would also have been well acquainted with Benjamin the dog, whose lead can be seen above. Ali had not wanted a dog, but the moment Wendy and younger daughter Emily, born in 1990, brought home a little black labrador puppy, he was smitten. "He just said 'hello Benjamin my baby'," recalls Emily.Ali spent that first night curled up beside Benjamin's cage, unable to cope with the pup's whining at being left alone.They spent their afternoons walking the hills of Teesside, culminating each week with a fish-and-chip supper in Saltburn. "Ben got more chips than anyone else," Emily says. "That's why he was slightly larger than he should have been." He was a great family man, but not exactly practical. "He used to call me to come and change a light bulb," says Malcolm.Wendy once found a print of Pele on the wall where she had asked Ali to place a picture of Whitby.Investigations revealed the Brazilian striker was covering the pockmarked walls where Ali had unsuccessfully attempted to hang the image of the harbour town.His cooking was not much better: he once exploded a can of beans when he put it directly into a pot of boiling water. When Italian striker Fabrizio Ravanelli signed for Middlesbrough, Ali decided to treat his family by cooking them pasta. "He just cooked some dry pasta and a jar of sauce but he looked so proud of himself," Alison laughs. "The pasta was rock hard. We had to eat it though as he looked so pleased." He also had a "wriggle bum" according to Jennifer, which claimed many pieces of furniture. "There isn't a chair in this house which hasn't been taped back together," says Wendy. Alison recalls her father putting his foot through her wedding dress as they arrived at the church. "He was so clumsy but just always seemed totally oblivious to the destruction he caused!" Ali died on Valentine's Day 2016 surrounded by his loved ones, three months after being diagnosed with bowel cancer.His funeral brought his hometown to a standstill, well-wishers lining the streets as his cortege passed his favourite haunts.Some 5,000 fans congregated in the Riverside Stadium to applaud as Ali was driven along the pitch before being taken for a private funeral. Benjamin sat in the front seat of the passenger car and pew of the church, his eyes fixed on Ali's coffin, according to Ronnie. "It was only after he died that I realised how much he had done for others," Wendy says.Ali raised funds and awareness for numerous appeals including Zoe's Place, Children in Need, motor neurone disease, Sport Relief and the Middlesbrough Hospice. "He would never say no to anybody," says Jennifer.And the fundraising continues.A 5km run has been staged in his memory each year since his death, fitting for the man who completed the first Great North Run. And his words live on too, his most famous quote having been painted on a wall on the approach to the Riverside.The Voice of the Boro will not be forgotten, says Gordon. "The world is a much quieter place without him."